The SU Literacy Corps mobilizes over 200 trained student tutors into the community every year. Tutors provide rich literacy support in a variety of Syracuse area classrooms. Last year, our tutors collectively logged over 25,000 tutoring hours and provided support for over 5,000 students. 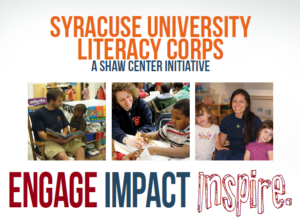 The Literacy Corps is a nationally awarded community engagement initiative dedicated to working with students and teachers in the Syracuse City School District.